The Crawford Fund’s Qld State Committee is proud to have sponsored nine 2016 scholars to attend this year’s annual conference on ‘Waste Not, Want Not: The Circular Economy to Food Security’. In addition, the support of Central Queensland University (CQU), University of Southern Queensland (USQ) and University of the Sunshine Coast (USC) allowed six more scholars to attend the conference this year. “Waste not, want not: the circular economy to food security” was one of the most productive, influential and focused conferences I’ve ever attended. Although the conference theme was very specific, the diversity of speakers was amazing. Crawford memorial address by Professor Louise Fresco was an eye-opener indeed! She not only revealed the gravity of food security challenges but also proposed very pragmatic and unique solutions. The best thing about this conference was the immense opportunities for networking. I really enjoyed this unique forum to improve my inter-personal communications, socializing skills and knowledge. Colleagues from different domains of agriculture had broadly different perspectives about food security, however, everyone had a strong and logical linkage with the subject. I had a chance to talk with leading scientists in the field and learn innovative ideas. The interactive discussion with other scholars was exciting, informative and encouraging. I was able to share my research experience and was really amazed to see that people were keen to listen about my work and its significance for food security. I am sure many other scholars might also have had this positive experience. The structure of conference sessions was really interesting as I was able to learn a lot through a broad keynote speech related to a theme followed by very specific case-studies on the same aspect. My understanding on food security and sustainable agriculture was significantly improved by listening to multi-disciplinary view-points. I participated in the special lunch-time discussion which was a nice experience. We discussed a wide range of topics related to food security, youth engagement in international agriculture and global agriculture research dynamics. The scholar day activities were really full of learning and positive discussions. I had very nice discussions with many scholars and mentors. I really thank Crawford Fund for the scholarship which enabled me to participate in such a dynamic scientific gathering. As a researcher in the area of sustainable agriculture internationally, this conference has improved my understanding, knowledge and skills. I had significant input for future research plans and saw the opportunities for potential collaboration. It was not only theoretical knowledge sharing but the practical experiences of fellow researchers and senior scientists were illustrated. I would love to continue my connection with the Crawford Fund and keep seeking guidance from my mentors. I appreciate the great guidance of Dr Bruce and Dr Dierdre who introduced me to many people related to my research area and are still guiding me from time to time. Meetings such as this, of people from diverse disciplines motivated to work together to solve common problems, are paramount for addressing today’s most pressing global issues. I soon knew I was surrounded by like-minded people from diverse disciplines at the 2016 Crawford Conference, themed Waste Not Want Not. Though I am from a veterinary background, my One Health research has had an increasingly social focus. Encouragingly, a thread I saw running through this Crawford conference, which resonated with me, was a theme of social and environmental justice. This thread of justice and equity is common to consumers, producers and all other stakeholders, whether they deal in plants, animals or human health. This was the major highlight for me: Being surrounded by, learning from and building relationships with early, middle and late-career researchers who are working towards an equitable global food system. An issue of equity repeatedly addressed was access to innovations. Dr Washington Otieno emphasised that a key to success for CABI’s program ‘Plantwise’ was ensuring plant clinics were accessible and reliable for farmers. Mr Rodrigo Ortiz spoke about the need to incentivise the private sector to innovate for the smallholder context, as often innovations are targeted at larger producers and inappropriate for smallholders. Prof Ashok Gulati described simple, context-appropriate innovations making big differences to food loss, such as elevated push carts to replace ground-level food baskets. The ‘biogas rucksack’ introduced by Dr Bernadette McCabe was truly remarkable! Another standout feature of the Crawford Conference, which was partly a reflection of the food-waste theme, was the truly global focus, not excusing ourselves from the problem or solution. In fact, keynote speaker Dr Karen Brooks (IFPRI) opened the main conference day with an admission, “This is (a photo of) my fridge; we are all part of the problem.” Later, Mr Brian Lipinski, using the “farm to fork” metaphor, explained that there are greater food losses closer to the farm in low and middle income countries and greater losses closer to the fork (fridge) in high income countries. Dr Steve Lapidge also reminded us, the world would benefit if we all stopped being quite so fussy and ate “ugly” food. A further highlight for me was when, thanks to Dr Joanita Jong, village chickens made it to the stage. Two points Dr Jong made are that in Timor Leste, village chickens are often fed scraps from restaurants, utilising nutrients rather than wasting them, and that village chicken carcasses are sold with all their organs available for utilisation, unlike supermarket carcasses. Livestock were emphasised by several speakers as an important aspect of global food and nutrition security, forming part of stable ecosystems when incorporated properly. After the final discussion panel, Prof Louise O’Fresco left us with a dare – Look in your own fridge tonight! Definitely a point to take home! Being invited to take part in the 2016 Crawford Conference as a Crawford Scholar was both exciting and intimidating. For a 24-year-old honours student, fresh from undergrad, with NO conference experience, the idea of interacting with highly respected academics, world leaders, and even potential employers, was pretty daunting. However these feelings were soon put to rest when the first Scholars day commenced. It was a great introduction to the scope and feel of the conference. Throughout the day we heard from peers and mentors, invited speakers and organisations, which really opened my eyes to so many exciting prospects. The first highlight of the 3-day event, was hearing about the myriad of potential pathways (e.g. Scope and AVID program) that would allow me to travel, use my skill-set and learn, as well as provide help to an area of need. This gave me the idea of pursuing a volunteer period after my honours program, and before I jump into my PhD. That evening we attended the Sir John Crawford Memorial Address and networking dinner which brought with it my second highlight of the conference: Dr Louise Fresco. Dr Fresco addressed the audience with grace and passion. She instantly became a significant role model to me. She was a strong, intelligent WOMAN with the ability to command and to hold an audience spellbound with the stories of her research and her life. The conference itself was a world of information, knowledge and the skill-sets to make change happen. There was a fantastic variety of speakers: young, old; international, local; research, development; industry or individuals – all of whom were ‘making a difference’. The main theme of ‘Waste not Want not’ was clear. $750 Billon (US) worth of food is wasted in the world annually. That’s enough food to feed 3 billion of the worlds undernourished. This shocking fact was reinforced numerous times throughout the conference, and I’m sure will impact all who attended way beyond the 3-day event. The ACIAR Graduate Research Officer role also sparked my interest. I had not contemplated actually getting a job after my honours year (let alone moving to Canberra) but hearing from Jenny Hanks and other post-ACIAR grads has put new thoughts into motion. The mentor program was another tremendous aspect of the conference. I was lucky enough to be paired up with Kep Coughlan who was a real asset to my time in Canberra. He never hesitated to spend his valuable time with me, to introduce me to potentially beneficial contacts or to simply check-in with me and see that I wasn’t being completely overwhelmed. I benefitted from the conference in so many ways. I gained experience in large networking events, which helped me develop the skill of succinctly explaining/talking about my research to different audiences. It also broadened my horizons of potential future pathways and got me in contact with others in my research field. Finally it threw me into a pool of like-minded people who are either going through the same motions as I currently am or have survived their post-grad experiences. This was the encouragement and motivation to know I am not alone, to continue on the journey I am on, and to follow a career in international sustainability. Attending the Crawford-Fund Conference on the 29th – 31st August was indeed a great opportunity for me to meet some renowned researchers and delegates from around Australia, Africa and Asia-Pacific. The major benefits of the 3 day-long conference for me was gaining insight and understanding pertaining to international agriculture and food security issues encountered in different countries of the world. This allows me to appreciate that though there may be no serious food security issues in my own country (Fiji), there are people in some parts of the world that are dying to be fed. In addition, attending the conference had allowed me to meet up with some leading experts in different fields of research, as far as food security is concerned, as well as young researchers and the discussions provoked during the different presentations by leading scientists like Professor Louise Fresco were really interesting. Of great interest was the mentor-mentee concept which was coined during this conference. I personally feel that this was such a tremendous idea where developing researchers like me are not only confined to our panel of supervisors in our different institutions, but can also seek advice from our mentors to whom we have been introduced during the scholars’ day in Day 2. The mentors were able to share their ‘pearls of wisdom’ with us which I believe will be able to assist me in my endeavours to be a researcher. Also, during this session, I was able to learn from other volunteers and their experience in some developing countries where food security was of a great concern. This was a real eye opener and thought provoking for me. In conclusion, the conference was very informative and I was able to gain more knowledge on food security issues in some developing countries and the role that international agriculture research plays in developing a food secure world. The Crawford Fund Conference gave me insight into the important role Australian agricultural research and extension plays in developing international food security. The keynote addresses and cases studies increased my awareness and understanding of food waste and loss along the field to fork value chain. A key message that resonated with me was the trend of most food waste and loss being “near the fork” in developed regions and “near the farm” in developing regions. The opportunity to connect with and learn from leaders in global food security was an empowering and motivating experience. A particular highlight was the Sir John Crawford Memorial Address presented by Professor Louise Fresco, President of Wageningen University and Research Centre. Professor Fresco’s address “The Future of Our Food” presented positive insight on where we stand in understanding the future of food. By placing food security issues into a context relevant to my life and study, this address allowed me to realise the very real opportunity for me to create positive global change. Meeting young people starting out with career goals similar to my own has given me the courage and drive to keep exploring global food security as I continue my undergraduate degree. 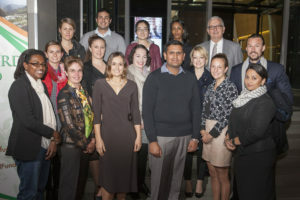 In particular, the Crawford Fund Scholar Days provided an invaluable opportunity for young scholars to connect with one another and learn from mentors with experience in the food security sector. The Scholar Days also included seminars led by Researchers in International Agriculture for Development (RAID) representatives who shared knowledge of how to get your foot in the door and lead a successful career improving livelihoods and food security in developing countries. Following the Crawford Fund Conference, I have been able to bring new knowledge and ideas about food loss and waste to The University of Queensland School of Veterinary Science in order to raise awareness of the roles veterinarians and veterinary researchers can play in the global food supply chain. This is a project I hope to continue working on and expand in the years to come. The Crawford Fund Conference and Scholar Days provided a platform in which I could explore my passion for food security through discussion with current and future leaders from wide variety of backgrounds. I believe this is an important stepping-stone to a career focused on food security and sustainability in developing nations. I would definitely recommend this incredible opportunity to anyone interested! Attending the Crawford Conference and Scholar days was a fruitful process which has benefited me in a number of ways. The most obvious benefit was meeting other scholars and the very worldly mentors. It was fantastic to meet likeminded, motivated people from a diversity of research backgrounds. They provided me with insight into some new avenues in international agricultural research that I had previously not considered. Some of these opportunities include RAID, volunteering openings and more links with leaders in aquaculture research. I hope to sustain contact with many of the scholars and mentors, and potentially become colleagues in the coming years. Aside from the career benefits, it is always great to be reminded that other people care, and are doing something about improving agricultural, international development and sustainability. The most useful aspects of the Scholar days for me was hearing first-hand accounts of international research from young academics and government workers. The road ahead in research can be very daunting at times, however the personal reflections from Dave, Skye and Jenny made things seem more possible. Every generation of workers faces unique challenges, so although the more senior mentors can offer a wealth of advice, it can sometimes be more relevant to hear from people only a few steps ahead of you. My highlights from the conference were the presentations from Prof Louise Fresco’s and Dr Karen Brooks. Both women are engaging speakers who impressively covered the ‘big issues’ with class and some new perspectives. Simon Costa also provided a refreshing outlook during the conference proceedings. His bold account of success in alleviating poverty were thought provoking and inspiring. I hope many people took away some of his passion and proactive attitude. Aside from these stand out presentations, the conference overall was well structured and extremely relevant to current global issues. Food security, agriculture and the environment are the issue that all the smart people should be engaged with! Thank you Crawford family for your generosity. I am very grateful for the opportunity to participate in the conference, Scholar’s programme and funded research trip. The experience has left me with many fond memories and the drive to persist in this important area of research. I am amazed how much this small organisation has achieved. Keep it up! It was great to have the opportunity to attend the 2016 Crawford Fund annual conference “Waste not, want not: the circular economy to food security” as well as the Scholar events. Attending this conference was certainly eye opening for myself and gave me a broad perspective of the issue of food loss, waste and security. At first, coming from an aquaculture background, I felt a little out of place, but I soon learnt that there are so many shared issues and it was really good to hear different stories and to still find the commonalities. It was also amazing to be able to meet and talk with some of the speakers, other attendees and Crawford members, who were all very open and willing to share their experiences and potential opportunities in the future. One of the key issues/messages coming out of the conference that really hit home for me, was the fact that most of our food loss and waste in the developed world is “near the fork” or in our own home, but in developing areas food loss and waste is mostly during production, handling and storage. Very different. It was also interesting to hear the differing, and similar, ideas and opinions on how to tackle this issue. The Scholar Days were really engaging and provided heaps of information on how to get into international agriculture research as well as more general career advice. Prof Louise Fresco gave a great quote that we as young researchers need to be a “jack of all trades and a master of one”. This has really stuck with me and I think a great motto to go by. The introduction of mentors this year was perfect for this type of conference. It gave a familiar and friendly face that you could easily approach when sometimes you may have felt a little out of place or overwhelmed by the situation. My mentor Prof Bob Lawn was great and I’m very appreciative for his advice, help and support whilst in Canberra. He is someone who I will definitely keep in contact with. Overall the Crawford Fund has been a great experience and something that I have benefitted from immensely both personally and in my research. As a PhD student it is inevitable to find trends in our field of study. As we inform ourselves and progress in our line of research, we tend to follow specific researchers, projects and techniques that help us thrive as researchers in the near future. It is easy to be shortsighted, and forget to explore other perspectives to one problem, not because we are biased to a particular field of research, but because we are used to following specific topics we see as important in our field. The Crawford fund conference allowed me to see different perspectives on food production and waste. It provided a unique opportunity to learn from leaders in different fields of study, allowing me to separate myself from the tunnel vision of my degree, and enjoy different standpoints on what other people find truly important in food waste, and what needs to be done to prevent it. Listening to Professor Louise Fresco’s unique perspective on how food production should adapt and change with technology, or Simon Costa’s fierce passion when finding simple solutions to complex problems, are a couple of the most influential discussions from the conference, which I take as important lessons. Networking during the conference changed my views on biosecurity and food production. By listening to people with whom I would not normally have a chance to interact, I adapted my way of thinking and priorities in regards to food production in aquaculture. In the same way, I had the opportunity to discuss my research on biosecurity in aquaculture with people working in different fields of food production. I would like to thank the Crawford Fund for giving me the scholarship I needed to travel to Canberra and be part of the conference. It was a unique opportunity with lessons I will surely remember. I encourage other students to attend the conference and allow their own points of view and perspectives to be challenged, and to detach themselves from the tunnel vision we develop through mountains of research articles, reviews and journals for our research degrees. Listening to the speakers gave me a better understanding on the constraints existed along the food supply chain and some research conducted so far. Now I also have better understanding on the role of my research and its potential contribution in improving animal welfare during live export between/to developing countries. The conference events all highlighted the importance of effective and efficient communication skills with agriculture industry and public. This skill is so important that I need to improve as an agricultural researcher during communication with people of different backgrounds. It is wonderful to have this great chance to communicate with speakers, coordinators, mentors, and scholars and to be exposed to the opinions emerging from various sectors in the conference. Food Waste is highlighted in the conferences, while how to solve this issue and division of responsibility along the supply chain and further research on feasible strategies required are not discussed thoroughly. Besides, this year I found that there was not much topic, speaker, or scholar focused on animal production and welfare issues. I suggest this could be improved for 2017 Annual Conference. I would like to sincerely thank CQ University for sponsoring and awarding me the 2016 Crawford Fund Conference Scholarship. I also extend my thanks to the Crawford Fund for organizing and hosting such an immensely fruitful event. The focus of the conference on food loss and waste issues and how wasted food can be better managed, was particularly relevant to my PhD research, which is on domestic food waste behaviours and policies in the CQ region. It was an honour to meet and network with distinguished scientists and scholars whose academic and professional inputs are instrumental to Australia’s remarkable contributions to global agricultural growth and development. I had the tremendous opportunity to be assigned Dr Helen Garnett as my mentor for the duration of the conference. Thank you Helen for all the priceless scholarly and motherly advice that you gave me. The group mentoring discussions were also key pointers for investing time in international research engagement, as crucial paths to advance a single disciplinary niche into a multi-disciplinary prospect. Among other useful knowledge that I gained through the discussions, I learned the importance of delivering and building records of best-case results, which could greatly benefit research communities and governments at the global level. The networking sessions with scholars and delegates of diverse disciplinary backgrounds were memorable and made the event an extremely engaging and rewarding experience. I had the pleasure of sharing my own and listening to other scholars’ research; learning about innovative ways of doing research from broad-ranging perspectives. I’m looking forward to keeping in touch and maintaining the connections I formed with the many interesting scholars that I met during the conference. A range of informative keynote speeches, programs and projects were presented; research undertakings were demonstrated on global efforts to combat food loss and waste in which Australia plays a significant role. The presentations also highlighted exemplary international agricultural research that signify the values of telling compelling stories to engage a wider dialogue around evidence-based research. Dr Louise Fresco’s speech was a notably thought-provoking one that also captivated my attention. She highlighted that there aren’t the right sets of policies in place to facilitate agricultural growth, development and appropriate management of waste and loss in most developing countries. Part of the solution, she stressed, includes remedying the under investment in agricultural research through adequate flows of investment and committed collaboration of partners on the ground. Another key highlight of the presentations for me was Dr Brian Lipinski’s overview on the importance of developing global accounting and reporting standards for food loss and waste. I appreciate the emphasis since having such standards as vital tools to manage food loss and waste can help to draw useful conclusions and to encourage action on realistic preventive measures. As in-depth as the food loss presentations and discussions were, it would have been equally extremely important if the ‘food waste’ theme of the conference was also given sufficient coverage. Evidently, the household supply chain segment accounts for the largest proportion of food waste in most developed countries. Accordingly, presentations on food waste related programs or research in the developed countries would have opened the floor to a more engaging debate and insightful remarks from participants. The last but not least enlightening part of the conference was the messages conveyed by RAID and Scope Global on strengthening careers and networks through volunteering. The messages have inspired me to recognize volunteering not only as an opportunity to contribute within my field of expertise, but also as an essential tool to develop and enhance creativity that may eventually translate into a research-worthy endeavour. My overall reflection as a researcher is that the scarcity of natural resources will undoubtedly continue to challenge the primary vessel of food production i.e., agriculture. Therefore, sustainable food production and consumption are indisputable practices every segment of the food supply chain must uphold. I left the conference with an assurance that an interdisciplinary approach to doing research is a fundamental strategy for aspiring scholars to pursue in addressing food loss and waste challenges, and also to help develop and recommend realistic solutions to tackle those challenges. Taking part in the Crawford Scholars event was an inspiring and useful experience. Meeting and connecting with upcoming undergraduate and post-graduate students, learning with fellow peers about the science and the practical considerations in the circular economy of food security, as well as connecting with other researchers made the trip a valuable investment of time and energy. In particular, learning about the group called RAID (Researchers in Agriculture for International Development) was one of those “ah-ha” moments as part of the scholar days as it linked, for me, the opportunities and possibilities of how volunteers and experts can contribute to a multiplier effect in capacity building within large projects. To see this group in action and working closely with the Crawford Fund was great to see and be a part of. Also, it was rewarding to be assigned a mentor who provided great input, strategy and insight into my current ACIAR work and further enhanced my understanding of the important role ACIAR play in international development. In particular, the need for supporting practice change in the “everyday” around food production, food waste but also retaining essential nutrients within the soil and fresh food supply was an informative discussion to be a part of. With new standards emerging for tracking and measuring how much and where food gets lost in the chain, the opportunity to connect with and hear leading researchers, strategists, economists and business leaders at the conference and scholars days provided opportunity for not only learning, but also to think through how the information could be applied – in research, in teaching in the ‘everyday’ awareness of food waste behaviours at home and at work! Our planet produces enough food to feed all 7 billion people, yet approximately 925 million people across the globe are undernourished as a result of ongoing hunger. The amount of food waste and food losses that result from our food systems are alarming, but as the 2016 Crawford Fund Annual Conference “Waste not, want not: the circular economy to food security” showed, there is much that can be done to reduce this food waste, to prevent these food losses, and to eliminate hunger. Each issue has its complexities, but one of the key messages I took from the conference was that whilst we need to understand the broader issues of the global food system, we must take a bite size piece of the overarching problem and aim to solve that. I think this is what Professor Louise Fresco meant when she said, we need to be a “Jack of all trades, but a master of one”. We need to be able to understand how the work that we do impacts and “feeds into” the rest of the food system, but we must make sure that we master the part that we can make a difference in. As a Young Scholar, it was wonderful to learn from “masters” in the field of food security and international agriculture. It was fantastic to learn about the specific work that they do and how they play a role in the circular economy to food security. It was especially great to be able to network with some of the most influential members of the international agricultural community, to hear their stories, experiences, and knowledge in their respective fields. A great example of this was Dr Dana Cordell’s talk about phosphorus. Prior to this conference, I knew phosphorus was important to the production of our food, but I never realised how crucial the reuse of phosphorus will be to the future food security. I really enjoyed the Crawford Fund’s Annual Conference, as I learnt what organisations, researchers, and businesses are currently doing and what they are planning to ensure food security for the future. I also loved the Scholars’ days, where I learnt about the various career paths and international volunteering opportunities that are available to people working in this field. My favourite part of the conference was the opportunity to meet and build friendships with the other Young Scholars that had a passion for food security and similar interests to me. It was great to be able to discuss the conference content with them and to reflect on all that we had learnt across the Scholar days. I would like to express my thanks to the Crawford Fund team and to CQ University for the opportunity to attend this renowned conference, and to learn more about international agricultural research and the significant food security issues that our world is currently facing. I attended the Crawford Fund Conference from 29-30 August 2016, Canberra. The theme of the conference “WASTE NOT, WANT NOT: The Circular Economy to Food Security” and delved into issues such as food loss and waste along the supply chain. The various speakers broadened my understanding about food security, brought to the forefront the role of governments, public and private sectors, and the importance of partnerships and innovative models. The insights gathered informed one of my research interests, the role of entrepreneurship in agriculture and its potential for socio-economic development. The first scholar day was focussed on setting the context for PhD students and to some extent early career researchers. Discussions covered insights on ‘Working in a Developing Country’ and government supported volunteering opportunities. The key takeaway was the range of opportunities available to get involved in agricultural research through the Crawford Fund and other relevant stakeholders. Sir John Crawford Address and conference: The key-note speaker was Louise Fresco, President of Wageningen University and Research Centre. She shared her views on food scarcity and scientific ways to overcome the same. The key takeaway was the detailed understanding of the supply chain (production, product to market, and reuse of waste) and its intersection with food security. Discussion with Mentor: Brian Lipinski is an Associate in the Food Program at World Resources Institute in Washington. Unfortunately, Brian’s flight was delayed and we were only able to talk for a short time. We discussed the role of innovative business models, start-ups and private enterprises in reducing food-loss. It was great to get insight into the developments in the US which are further along in terms of maturity and feasibility. I went to an ACIAR Workshop on Policy effectiveness for food, energy and water security in South Asia instead of Scholar Day 2. I was initially invited by Prof Woodhead and after meeting with senior members from ACIAR at the conference, I felt that it would be a great opportunity. I am from India and the issues around food security impacting one of the largest populations of the world have always been of interest to me. The workshop focussed on multi-stakeholder research initiatives addressing issues of food, energy and water security in India, Nepal and Bangladesh. I was also able to share my research interests and contributions with Crawford Fund and ACIAR personnel, and DFAT representatives, some of whom were speakers at the conference (for example, Professor Ashok Gulati). This not only served as a great platform but also a pathway as I have been invited to contact the Indian representatives upon my next visit and see their projects in action. The conference was a rewarding and valuable experience for me and I would like to thank the University of Southern Queensland for supporting my attendance. The conference was built on a single stage format, with speakers on topic covering the full breadth of the food supply chain. Speakers I found especially engaging included: Louise Fresco, who presented the keynote on future trends in food including tailored nutrition and food printing and the simultaneous challenge of sufficient calories in the developing world, and adequate nutrition in the developed world; and Simon Costa who developed and distributed a micro hermetic silo for grain storage reminding us that funding is mainly directed towards researching increased agricultural production while post-harvest losses go unaddressed. I was also fortunate enough to hear my supervisor Professor Alice Woodhead address the conference on the topic of the last mile challenge which covered the tremendous difficulty of moving perishable goods through the infrastructure networks of mega-cities. At mealtimes I had many interesting conversations focussed on the global food system and received an introduction to an economist who studies intellectual property. Scholars’ days were held before and after the conference. At these the content was focussed on research careers and practical advice on working overseas. I had the opportunity to connect with other researchers, in particular the RAID network, a group of agricultural researchers working in Agriculture for International Development. This is an active community that holds meetups and workshops orientated to building research skills and collaborative networks. I was partnered in the Crawford Scholar’s mentoring programme with a Sector Specialist in Agricultural Productivity and Food Security at the Department of Foreign Security and Trade. My mentor was kind enough to teach me about DFAT’s role in foreign aid and the potential opportunity for businesses as suppliers of food etc. We have been in contact since the conference and I hope this will prove to be a positive relationship going forward. Overall the Conference was a very worthwhile experience with many opportunities to learn about developments in food security and to develop practical research knowledge. We currently produce enough food to feed 7 billion people, yet 1.2 billion people remain malnourished and another 1 billion suffer obesity and food related illness. By 2050 we will have 9 billion mouths to feed, and will need 70% more food. However, we currently produce 1.3 billion tonnes of wasted food p/annum (FAO 2011); equal to $750 billion USD ($310 billion from developing countries). So why is this? What is being done? And what can we do to address food security for the future? This was the key focus of this year’s Crawford Fund Annual Conference. As a scholarship recipient I was fortunate enough to attend the 2016 Crawford Fund Conference on the circular economy to food security titled ‘Waste not, Want not”—focussing on reducing food loss and wastage along the supply chain. This annual conference allows students, academic researchers, industry professionals and government agents to network, share ideas and brainstorm new initiatives for improving global food security policies. Although my current research project is not directly linked to food production and agricultural practices, the conference was beneficial for expanding my network and horizons. The introductory networking session for the scholars on Monday afternoon was a fantastic way for students to meet their assigned mentors, who acted as guides, role models and network contacts; we learned of the Crawford Fund programs and affiliated organisations such as RAID, ACIAR and Scope-Global who offer volunteering and post-graduate study opportunities overseas. This session provided a valuable experience to the scholars by allowing them to settle in, practice their introduction and communication skills, and workshop ideas before attending the formal memorial address dinner session and full day conference on the Tuesday. This year’s memorial address was delivered by Professor Louise Fresco, President of the executive board of Wageningen University Research Centre and member of the steering committee of the FAO panel of experts on food security and nutrition. Professor Fresco’s address was a passionate and inspiring story of past, present and future food necessities and offered an insight of where we stand in understanding the future of food. The additional speakers complimented her talk by addressing a wide variety of topics encompassing farm losses, farm gate to fork initiatives (packaging, transport and processing), supermarkets and supply chains, and food waste management and re-use; not to mention some innovative, and slightly scary (who’d have thought of printed foods!) technological food developments. The final day’s workshop session drew out key pearls of wisdom and advice for scholars moving forward. This session really helped cement new ideas in my mind and gave me the boost of confidence I was needing, such as to take action now, to not be afraid of trying once, or trying again, to show initiative, think outside the box, to apply any of, and all of the skills I have to each new situation, and to trust and believe in myself…. and luck! My closing advice to future scholarship attendees is read up on the companies and organisations, take business cards (even if it is just a piece of paper), collect cards and learn names! Take notes and follow-up with contacts.